Since I was a little girl, I’ve always been partial to pink. The color pink has always been a personal favorite of mine, from fuchsia to magenta to rose, raspberry, and ruby. I get it from my Granny, as she’s a pink lover too. In the last couple years the popularity of pink has seemingly been on the rise. 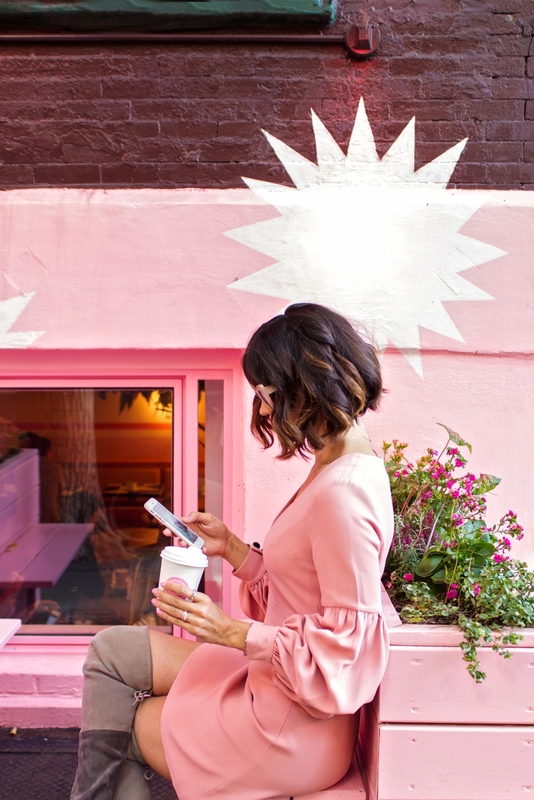 And pink is still one of the most on-trend colors for the season. For the first time ever back in 2016, Pantone chose two colors of the year: rose quartz and serenity. Given that rose quartz is half of that equation, it’s no surprise that blush had such a resurgence in the fashion world. After all, blush pink is just a tad lighter than rose quartz. This beautiful pastel color has made its way to the runways, to the streets, and into the stores. Even if you’re not one who gravitates towards color, blush might suit you very well, as it’s subdued and understated in a sophisticated, chic way. When it comes to fashion choices, there are many different ways you can wear this sought-after color. First, the most impactful way to wear blush pink is in a monochromatic look. Because of its beautiful muted tone, blush pink acts almost like a neutral. This makes it is a great choice for a monochromatic look. Whether by way of a pant suit, skirt, and blouse, or a dress, you also don’t need to be afraid to pair blush accessories with the aforementioned looks. Blush on blush takes on a stylishly elegant look day or night. Secondly, consider pairing blush pink with other neutrals. In fact, think of this pale pink shade as a stand in for black, white, or gray. Next time you grab your black on black outfit, swap out part of the outfit for its blush counterpart. Or if you’re wearing a white blouse with black bottoms, add a blush coat. Or if you’re wearing a cozy gray sweater this winter, try a blush pink hat. Pastel shades are light, airy, and calming, and blush certainly fits seamlessly in there. 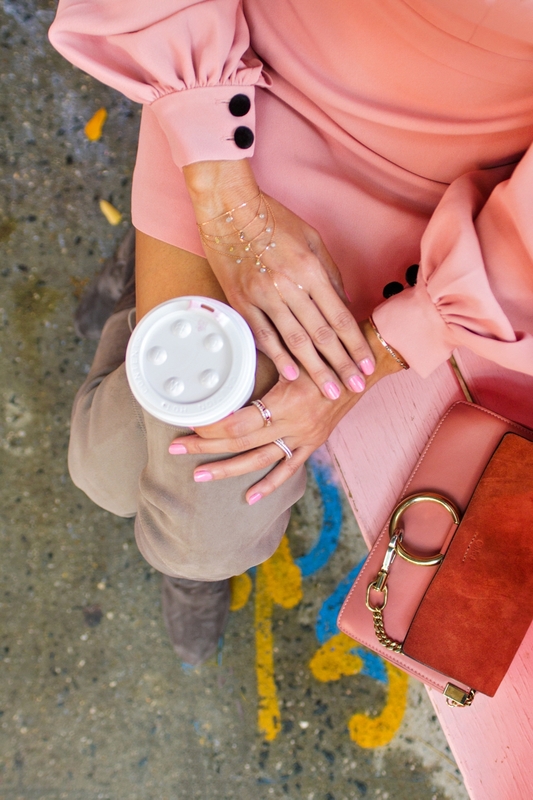 Pairing blush with other pastels is a great way to bring the color into your look. And while pastels are typically synonymous with spring, don’t be afraid to wear this color palette well into the fall and winter. Actually, you’ll be right on trend! The color pink tends to be thought of in dainty, feminine ways, with lace being at the forefront of fabrics to go with this hue. However, step out and try a blush leather jacket, a fitted blush dress, rock stud shoes in blush, or even a blush vintage tee. Don’t get us wrong – we still love a full-on feminine fashion moment. So, don’t feel like you ever have to shy away from that. Try blush pink on ladylike lace and bow blouses and pleated skirts. Alternatively, you can ease into the blush look with accessories. If you want to stick to your other neutrals for your apparel, bring out blush in your accessories. Try a blush bag or throw on a blush necklace. You can wrap yourself in a blush scarf or add a pair of blush sunnies to complete your look. 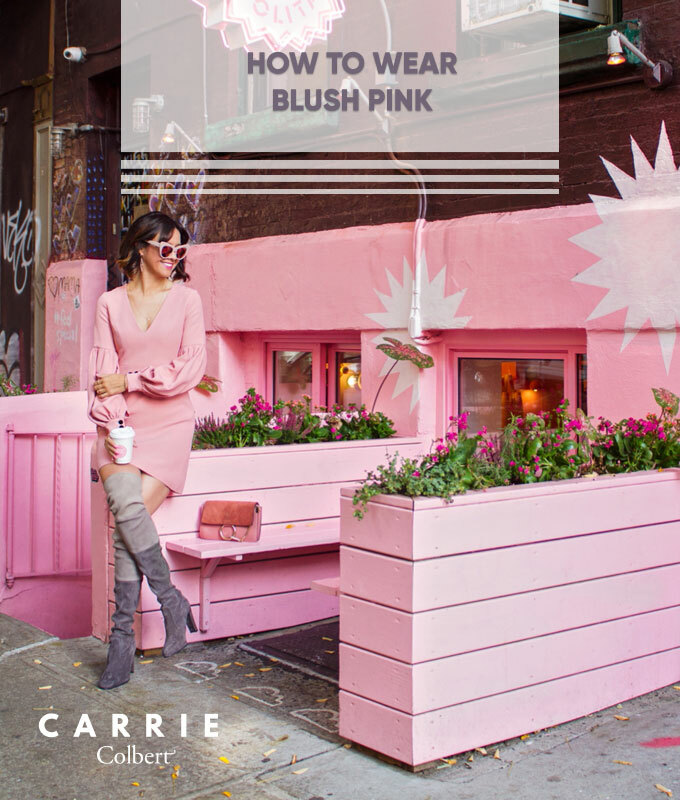 For more help with the color blush, check out these 5 tips for how to wear blush pink. As you can see, no matter what your style might be, there are endless ways to work blush into the mix. This color isn’t going anywhere anytime soon. It’s going to continue to be front and center, and will serve as the newest neutral for years to come. Have you added this color into your wardrobe yet? What’s your favorite way to wear it? Let us know! We’d love to hear. Finally, have a great day! Blush is definitely a favorite color of mine for spring! Your picks are so pretty-I might have to add a few to my cart! As this chapter ends, another one begins. From me to you, I say thank you. A fun, flirty, flowy black dress with lots of colorful accessories.